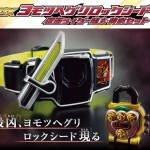 “YOMOTSUHEGURI ARMS, MEI KAI YOMI YOMI YOMI!” The latest Premium Bandai release happens to be one of the most sinister items from Kamen Rider Gaim, one that could pretty much kill its user from overuse. That’s right, this is the video for the Yomotsuheguri Lock Seed! With the cosmetic appearance of a gold and red Budou Lock Seed, this new release contains completely different sounds. Making its first appearance in Episode 42 of the series, this mysterious gold and red Lock Seed was promised to give its user enough power to crush Kamen Rider Gaim. Even though they were told that the risk of using it for too long could lead to it draining their life force, the user still decided to use it, enabling them to take on the form of Ryugen-Yomi Yomotsuheguri Arms. With the in-show ability to summon the weapons of the Overlords, it served to be a counterpart to Gaim’s own Kiwami Arms. The Lock Seed itself features the standard Squash, Au Lait and Sparking finisher sounds, but also features the phrases spoken by its user! 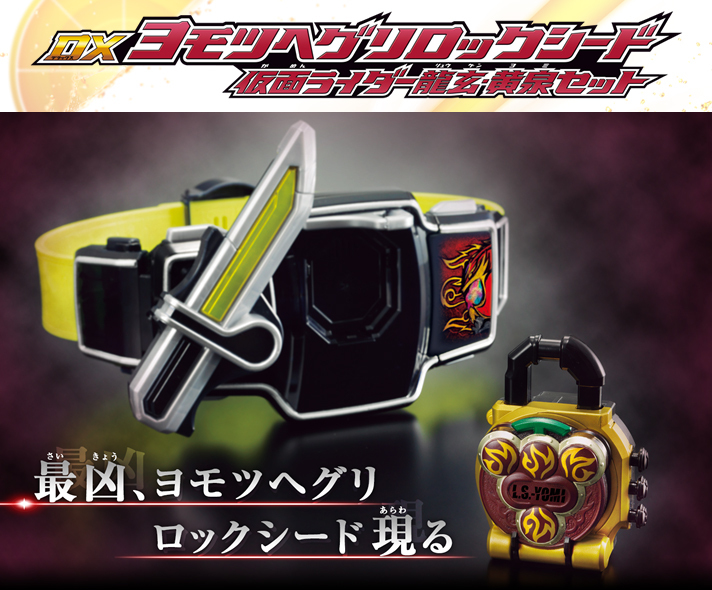 This Lock Seed also comes with the Ryugen-Yomi Rider Indicator faceplate that you can attach to your Sengoku Driver! The set itself was released just recently as a Premium Bandai item, for the price of 2160 yen. I'm not super excited by this, simply because of the character, but I am always keen on getting new Lock Seeds. I cannot wait for N-Y to ship this sucker out. This is perfect for those that want the sound of Miichi crying in agony in their pocket. I really can't wait to own this! I missed out on the original Ryugen lock seed and I'm surprise it went up so high for a character that most people dislike. Wait what? Why is the LED red? The shine's supposed to be green! The yellow also looks cheap, could be the lighting, but they used tarnished gold in the show, not plain yellow. Aw no... I was so excited for this, all blown away now. But hey... the sounds are really cool (crying Mitchy FTW) and the box is nice. Sigh... I should really restrain my expectations sometimes.